Chief Robert Gregoire took a vacation day to hold a sign on Memorial Circle urging drivers to give money to charities instead of panhandlers. AUGUSTA — Most days Robert Gregoire carries out his duties as Augusta police chief, but Gregoire took on a different role Friday — that of a faux panhandler working Memorial Circle. 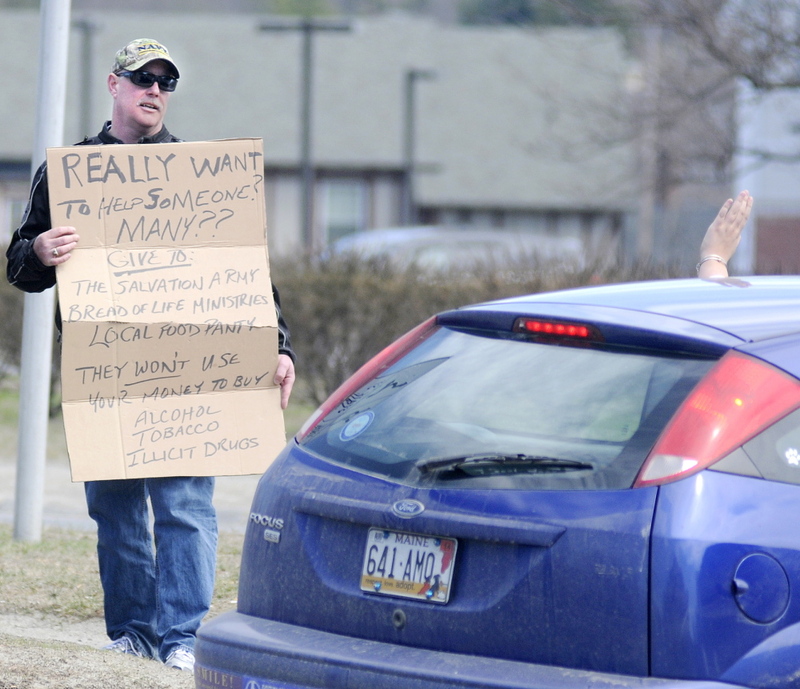 Instead of seeking a handout, however, Gregoire’s cardboard sign urged drivers to ignore the solicitations of panhandlers on the circle and instead give money to a social service agency that will serve the greater good. Though careful not to paint all panhandlers with the same brush, Gregoire said the reality is that many of those asking passersby for money will use it to feed their habits rather than for food or shelter. Lloyd Bowden, who was panhandling at Memorial Circle Friday said he is living in a relative’s basement in Augusta until he can buy a tent. Bowden, 55, said all the money he makes goes to food. Gregoire took up his position at 9 a.m. and planned to call it a day at 3 p.m. He hopes his effort will do more than discourage people from giving to panhandlers, but that it will inspire people to give to local charities. Wearing a black motorcycle jacket and a baseball cap with a visor pulled low over sunglasses, Gregoire was not immediately recognizable, even to some of the officers in his own department. Many drivers, apparently without reading his sign, rolled to a stop while holding cash out the driver’s side window. Gregoire politely explained he was not accepting donations and asked the driver to give to a local charity. “People are generous,” Gregoire said. Even other panhandlers, a few of whom dotted the rotary throughout the day, didn’t realize Gregoire was not asking for money. A few asked how much money he had made. One told Gregoire that he was standing in his spot. Gregoire said the man was welcome to stand next to him. One young woman, rebuffing Gregoire’s efforts to explain his message and motivation, eventually left money on the ground and walked away smiling. Many drivers, even when stopped in traffic just a few feet away, looked straight ahead, taking only quick glances to read Gregoire’s sign while not making eye contact or attracting his attention. Those who did read the sign and offered feedback overwhelmingly supported his message. “I’ve gotten positive feedback,” he said. The frequency of panhandlers on Augusta’s streets began to pick up last summer and Gregoire is expecting that trend to continue this year. Western Avenue, which has about 30,000 cars per day, and State Street, which has about 20,000, are popular locales for people seeking money. He said the number of complaints from aggressive panhandlers has increased in recent days as the temperatures have warmed. Gregoire said the men and women have a right to stand and hold signs, but state law prohibits them from initiating contact with drivers. There have been other complaints that the people are standing in places that block traffic or sight-lines. “At times it’s a public safety issue,” Gregoire said. Police will confront the panhandler in such cases. Last week, Portland decided to appeal a federal court ruling against its ban on panhandling in street medians. The city passed an ordinance last summer that banned people from standing in medians unless they were crossing the street, but a federal court judge ruled it unconstitutional. 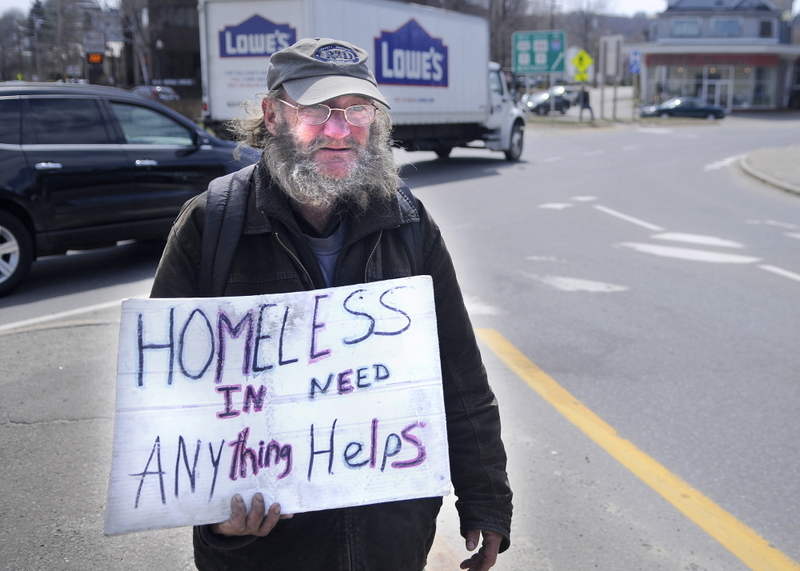 Other Maine cities, such as Lewiston and Biddeford, have also considered restricting aggressive panhandling. Gregoire said giving money makes people feel good, but that same sum of money can be used more effectively by social organizations that often get discounted rates for food, clothing and shelter. Donations to such agencies are on the decline, Gregoire said.